Sterling Hydrotech are a national Swimming Pool Filtration and Water Treatment Specialist. Previously they had to use multiple paper forms to schedule services and breakdowns. We looked at cutting the time it was taking to do administrative tasks by creating a business management system that controlled that information and created the required work documents. The system uses a powerful search tool to find any information and reporting tools to pull out important statistics and information. The system also included a cut down mobile device view for the engineers on site. This view shows the engineers the information they need while doing a job, including historical job information and equipment in the facilities. There are also buttons to be able to log their working, travel and break times. All this information is logged in the job history so the administration team can produce time sheets. 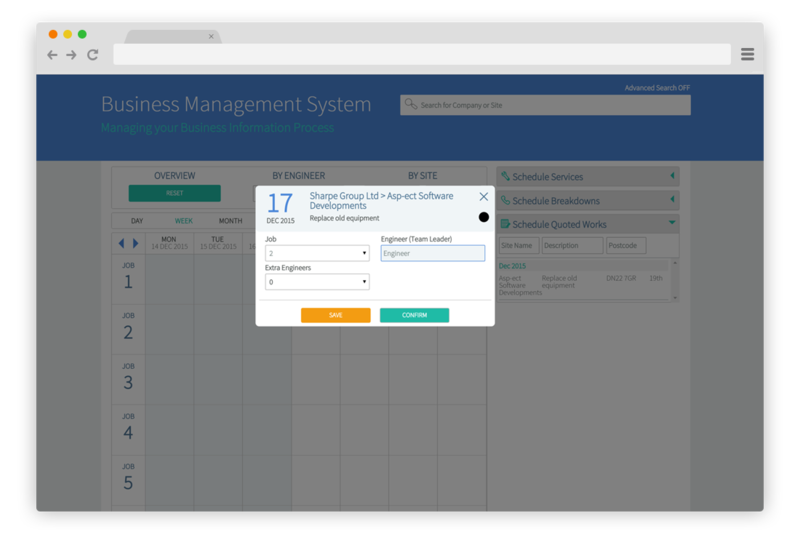 The scheduling facility allows jobs to be easily scheduled using a drag and drop interaction. 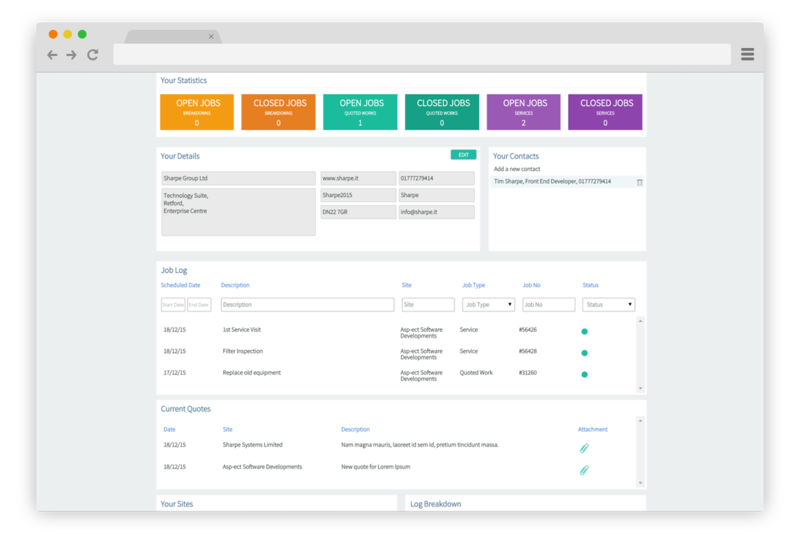 Jobs are filtered by type, location and customer to quickly find and schedule jobs efficiently. Once a job has been dropped onto the calendar a pop up box appears to confirm the details and add which engineers have been assigned for the job. 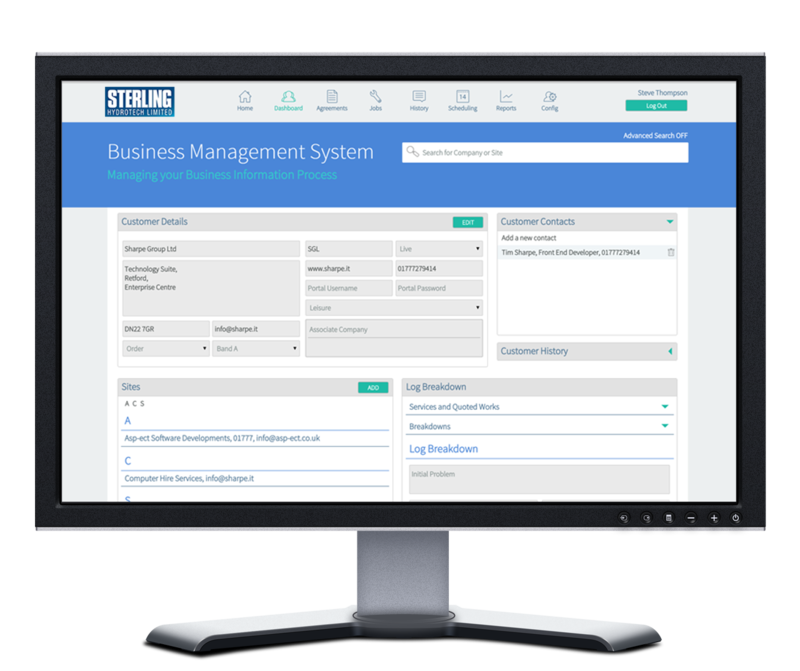 The system will then automatically add the job to the job log ready to be completed by the engineers. One engineer is given ‘team leader’ status, meaning they are responsible for the filling in of job sheets and collecting of customer signatures. Up to five additional engineers can be assigned to the job. We also created a clean looking portal for their clients to log on to. This gives them easy access to job information with work reports and outstanding quotes. From here the customer can also update company information including contacts and log breakdowns. If a customer logs on, they can see information for all sites, if a regional or sub regional manager logs on, they can just see site information relating to their region, and if a site logs on, they can see only their site’s information.